What I love about this dish is that all the flavours compliment one another, you get the freshness of the fish, the juicy burst of the cherry tomatoes, the lovely pasta to soak it all up – it’s great. And of course, that crusty bit of bread, to mop up any juices left on your plate afterwards. The piece of salmon I bought was quite big so I cut it in half for two portions, and I admit, I had this exact same dish again the following day for my lunch. Perfecto. Anyway, here’s the recipe, try it out! It’s a lovely simple meal with just the right tones for summer. Thanks for the recipe, CM! 2. Clean and prepare your salmon fillets – to do this make sure that the skin is properly descaled (run your finger up and down the skin, if it feels rough in one direction use a knife and (in a plastic bag) scrape the scales off. Be careful, scales get EVERYWHERE! ), and run your finger along the flesh to check for pin-bones. If you find any pull them out with a pair of tweezers. 3. 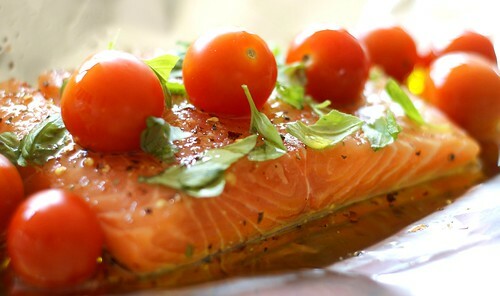 Make an envelope out of a large sheet of tinfoil by folding the edges in, place inside one salmon fillet, the cherry tomatoes, roughly tear some fresh basil leaves over it, season with the salt, pepper and chilli, drizzle with olive oil, and seal it. Bake for about 15-20 mins (when the fillets are a pale pink all the way through, and flake apart easily, they are done). 4. Meanwhile, boil a pot of water, salt it and add a tiny bit of oil to help separate the pasta. When boiled cook your pasta until al dente. Drain and reserve about a cup of pasta water. 5. 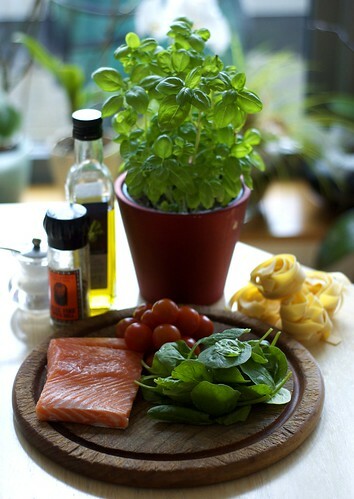 Place the spinach in a colander and pour over the reserved pasta water to wilt. 6. 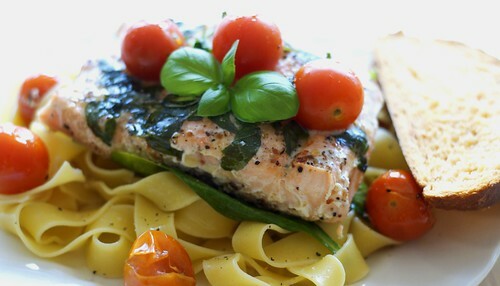 To serve, mix everything together, breaking up the salmon steaks and lightly mashing the tomatoes. Serve with crusty bread. 7. Get stuck in and enjoy the fruits of your labours. That forever-swimming-upstream salmon sure tastes pretty good, eh? Once again, thanks to CM for the recipe, and if you want to get involved with the project (awesome prize up for grabs, by the by), then you know what to do. Until next time, peace and love.